So, I’m looking at all this traffic footage and something occurs to me. 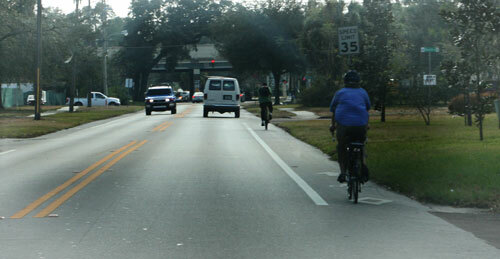 Motorists give other cars considerably more than three feet when they pass. Obviously, lane widths offer plenty of buffer when they are passing moving vehicles in adjacent lanes. But they give extra clearance when passing cars that are slowing to turn in a wide lane, too. They also don’t drive in the door zone of parked cars (even when there’s no bike lane there to provide them a safety buffer from car doors) Check out the tire tracks on a narrow road like Central. The left one is next to the center line, the right one is 3-4 feet from the parked cars (as far as they can get). In the photo above, the tracks are even farther from the parking on Orange, which has much wider lanes. If motorists naturally give another car more than three feet, why do we have to tell them to give an exposed human being three feet? If a person automatically drives his car outside the door zone of parked cars when he wouldn’t be physically harmed, why does he then ride his bike in the door zone when he’s actually vulnerable to getting killed? http://commuteorlando.com/wordpress/wp-content/uploads/2017/09/logo_Commute_Orlando-webhead-650x214.png 0 0 Keri http://commuteorlando.com/wordpress/wp-content/uploads/2017/09/logo_Commute_Orlando-webhead-650x214.png Keri2010-01-27 18:13:462010-01-29 10:09:54Why is that? An interesting observation… avoid scratching the paint? 1. We don’t. Motorists overwhelmingly (even the pinheads) leave a lot of space. 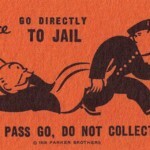 Some feelgood law isn’t gonna deter the scum. 2. The person has been taught to fear motorists coming from behind and hasn’t really considered the matter rationally. You knew both of those, so I look forward to hearing the other theories out there. One other observation you forgot to mention – on a four lane road with a 12-13 foot rh lane, motorists will drive to center between the curb and where motorists drive in the lh lane which is left of the center of the rh lane. On Smith Street, they’d track the same if there wasn’t a bike lane – which would NOT be the rh side of the wider lane. Smith is kind of an odd example because to the left of the left lane is onstreet parking (the spaces are empty), so the cars in that lane track farther right, probably causing the cars in the right lane to move right. Also, the bike lane begins there. It’s about 200 feet long and the ends before the intersection with Edgewater (WTF was the point?) so yes, they were tracking the center of the 12 foot lane. 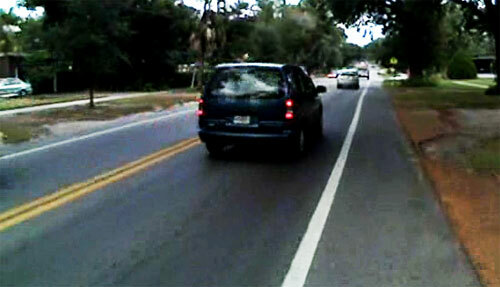 I find that it’s typical on a 4-lane road with median, that motorists track as in the photo at the website link. If you click on the photo at that link, it’ll show more detail, but I’ve learned to not put more than one link in so your spam filter doesn’t get snarly. Anyway, the cars in the linked photo RH lane track pretty much where the ones on Smith do if you imagined the bike lane gone. The ones in the LH lane track further right than usual, no doubt due to the parking. There’s nothing on Bear Creek to prompt anything abnormal other than that I ride the “line of sweetness” there on my commute. I don’t think my rides down that street are frequent enough to drive the overall tire track pattern very much. 1. That’s easy; I just ride in the middle of the lane. 2. This is lack of education on how to ride properly, but I don’t get it myself. If they’re so scared about drivers hitting them when they’re right in front of the car, which is where drivers are looking, I’m guessing it’s because they don’t have a mirror. If they don’t drive without mirrors, why bike without them? It’s not like they’re expensive or difficult to use. Orange Ave vs Smith St. The are probalby parked cars much of the day on Orange Ave so they stay to the left of the lane to avoid hitting them or an opening door. The bike lane on Smith St is probably empty most of the time so they drive in the center of the pavement between the curb and center line. The are probably parked cars much of the day on Orange Ave so they stay to the left of the lane to avoid hitting them or an opening door. The bike lane on Smith St is probably empty most of the time so they drive in the center of the pavement between the curb and center line. Interesting observation. I added 4 more photos. I haven’t measured the lanes in question, but I’m wondering if it has to do with the width of the general travel lane. I’m pretty sure Lakemont is wider than Primrose or Glenridge. All three of those BLs get more use than the one on Smith St, but still there are far more likely to be cars in the adjacent/oncoming lane than bikes in the bike lane so general tracking patterns aren’t going to be influenced by the presence of bicycles, but by the pavement/stripes and predominant traffic.